Do What You Can’t! – 1Beginner! Youtube Sensation & Creative Film Maker- Casey Neitstat! This article is inspired from the Idea of creative filmmaker, Youtuber Casey Neitstat! I have shared the link below to experience his idea, he mentioned this concept to become a creative content maker, filmmaker but I got so fascinated by his Idea that decided to apply this to the all necessary aspects of my life to reach my Goals. This idea really helped me to banish my fear & anxiety about what people might feel about Me. We always go for obvious choice. We often prefer to Do What We Can! & we are always suggested to do what we can! Beyond that either we stop due to our own fear or We are suggested to cease over uncertainty. So, you might have some misapprehension about today’s discussion, “Do What You can’t.” its sounds simple but absurd, that’s what we are going to unfold today. You got to see beyond the Obvious! My Story – Few years prior, when I decided to Pursue Writing, I was into bit of uncertainty about acceptance from People. I thought right Now I can’t! May be I Should wait for a while. I asked my parents , friends & few associates about my dream venture they said You can’t , You are not grown enough, You don’t have that much experience, you don’t have the ideas, content, vocabulary , few even said my English is not good. you must learn for next few years. What makes you feel that you can pursue writing? Are you crazy? Who reads nowadays? Stop thinking all this non-sense & take an admission to MBA, that’s what you need to live a successful life. For a while, I thought they are Right and I wandered from place here & there but when I got hold of this Idea. I said irrespective whatever people might say about me, laugh over me or criticize me or my thoughts, my ideas, my views. I am not going to give them a damn, I don’t owe them anything. How can they decide What I can & what I can’t or What I should? It’s my life, I am going to live it the way I want (wisely of course), so I decided I am going to pursue writing & my enterprise. I decided I am going to move beyond what I can. I am going to do what I can’t but for what I really want. I stopped asking people’s opinions, suggestions & approval & stated penning down my experiences. By the way this happened with many aspects of my life, I gave example of only writing. this happened every time I decided to take a leap & go beyond the ordinary views. Don’t just get stuck between you can & Can’t . You got to give a Go, anyhow. 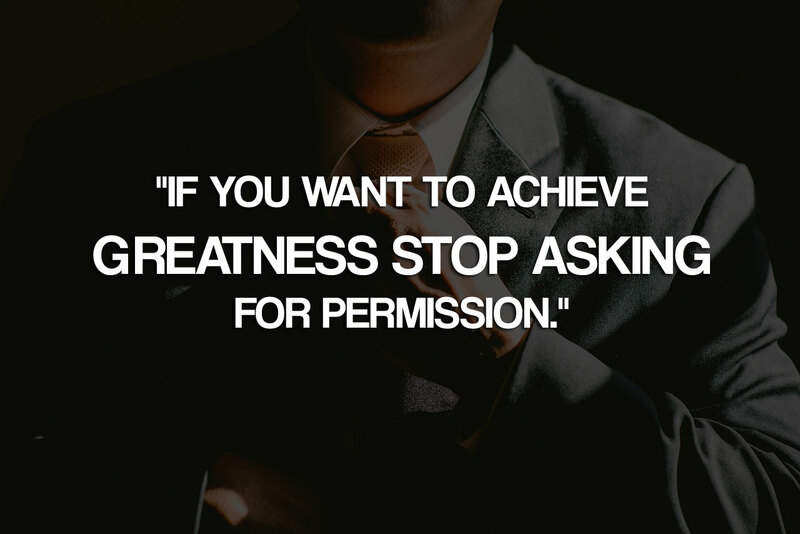 there is no point waiting for someone or asking for permission from somebody. you got to give yourself permission to fail. I feel what you really want is always possible if you willing to go through what you can’t i. e.the Fear of I can’t! Sometimes, No, may be too many times in your life you are not qualified enough to do something , still Go ahead & Do it. Prove your Haters, criticizers, doubters that they are Wrong. We always go for the things which are in our hand. We set a Goal which is just in our Grasp. We always look for the ideas only in our compass. Why? Because we are addicted to Luxury of laziness. Relaxation is beautiful name given to laziness by few people to hide their unwillingness towards advancement. Despite of potential & limitless possibilities ,People are living with complacency & decided to settle for less, meager way of life which is really disgusting. Our mind & body is paralyzed by the comfort zone of the feeling that we have set for ourselves. The tall walls of comfort Zone are built by ourselves & every day we strengthen them by our apathy. Over a period our Brain settles over what is in our hand, instead of going for what we desire. We are not even willing to set a goal slight beyond the normal stretch of Our Hand. We just want to stay comfortable. We always do what we can, still we want to be successful. But do you become successful? Nope! why ? Because when you do what you can you always stay in your comfort Zone. Success doesn’t come in comfort Zone. You got to step out of your comfort Zone. You got to intentionally step away from your comfort zone on every day, every occasion with every aspect of your life. You cant be successful just by doing what you can , you got to do something what you cant, if that’s necessary to go for your dreams & Goals. We all want to be Successful but we are not willing to leave our comfort Zone of I can’t. See you can’t be successful & comfortable both at the same time & there is misconception about comfort being termed as Happiness or Success. You got to get bit uncomfortable to Be successful. You got to take a chance on yourself, Throw yourself out of your comfort Zone, Do what You can’t! You must see this video & get Inspired! original By Casey Neitstat! Please note – The video is the content, property of Casey Neitstat, source Youtube.